She came out when she heard the sound of Jake’s hooves nearing the cabin and stopped at the door within reach of her favorite rifle; then she saw him coming down the path from the Summers. She would have know him even without the gray wolf at his side. He was pale and thinner than when she’d first seen him, but he walked easily. She knew he’d had to hang on to the furniture when he first got up. Star had told her. “Nope.” She didn’t tell him that she’d ordered one and it was its way. She also didn’t tell him that she was going to pick it up soon. He’d volunteer for that. He could help her and get out of the cabins that were possibly begining to stifle him. Brock had told her something about mountain men. As a matter of fact, he’d mentioned it more often lately. And that reminded her of a conversation a couple women had had in the general store a while back while she was there picking up more potatoes, salt, and some candy. “It’s not always easy getting a man to come up to scratch,” the older woman told the younger one. “It’s a lot easier scaring them off by getting romantic and possessive.” It sounded to Lorrie as if she spoke from personal experience. Lorrie began her attack on the porch as they sat munching cornbread. She touched his arm and batted her eyes. “It’s so nice having a man around the cabin,” she said. “You sure make a woman feel safe.” She batted her eyes again and hoped she wouldn’t puke. Or maybe he would. “You should come down for breakfast some morning. Real early.” This time she didn’t bat her eyes. She pressed his arm instead. She wasn’t surprised when he slid away, stood up, and mumbled something about getting back to help Brock milk the horses or something. Men, she thought, in relief and maybe a hint of regret. She wasn’t surprised when Brock came down the next afternoon and told her that their visitor had gone. Brock had taken him to town to buy a horse and was now on his way home. “What did you say to him, girl?” he demanded. She shook her head and grinned. “Men are so predictable,” was all she’d say. Detour Trail on sale this month! 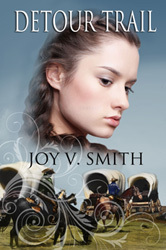 Detour Trail, my frontier adventure/romance, is on sale (half price) at Smashwords: https://www.smashwords.com/books/view/360381 until July 31. Lorrie forges her own trail after starting out on the Oregon Trail. I just got the June issue of True West Magazine; it’s another great issue full of historical articles and photos. One of those articles–the background of the murderous Bender family–especially interested me because while I don’t recall them specifically, I must have been aware of them or others possibly because I included a similar situation in Lorrie’s adventures in Detour Trail. “This book is certainly filled with a lot of adventure and drama. And I love that the main character, Lorrie, is one gutsy chick! She is definitely someone I would want to have with me if I was traveling anywhere! Detour Trail is on a Top Ten Reads list too.